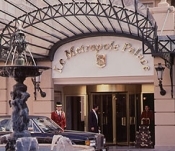 The 5 star Metropole dates back to 1889 and offers opulent luxury in addition to its' wonderful location only steps away from Casino Square, the Cafe de Paris and an array of luxury boutiques. The Metropole offer 149 guest rooms and also offers the Joel Robuchon restaurant par excellence, a bar, swimming pool and spa facilities. Race viewing is possible from the restaurant.